Hi guys, we know very well about the Google Play Store. With the help of Google Play Store you will be able to easily download any app or games from this platform. Google Play is also known as Google Play Store. It is a platform from which you will be able to easily browse and download different applications. Lot of apps either free of cost or chargeable on Google Play Store. 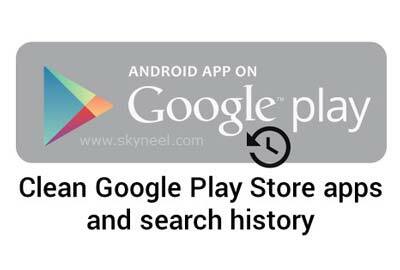 During searching or installing any app from Google play store the history is automatically saved in your Android phone. This guide helps you how to clean Google Play Store apps and search history. Sometime we have to face lot of problems when Google Play Store is not working properly and we have to discussion regarding these problem in our previous article. Lot of time we have to face few errors on Google Play Store and want to know the solution how to fix them. If you want to remove Google play store search history then you have to take following steps. Step 1: Open the Google Play Store in your Android phone. Step 2: Tap on the three dash lines which is located on the top right corner of Google Play Windows. Step 3: Scroll down the list of options and then tap on the Settings option. Step 4: Tap on the “Clear local search history” option which is available in General group. This option remove all searches which you have performed from this device. If you want to remove or clean Google Play Store apps then first you have to check you have an updated version of Google Play Store. Step 3: Tap on the My apps & games option. Step 4: Now you will get all listed apps and games which you search or installed in your Android phone. Tap on the All option and then tap on the cross button of any app or games which you want to remove from your Google Play List. Note: If you want to know the version of your Google Play Store then you have to tap on the Settings option in the Google Play Store and scroll down the available options and check the build version of Google Play Store. I hope you like this article after reading this article you will be able to easily clean Google Play Store apps and search history from your Android phone. If you have any suggestion regarding this article then write us in the comment box. Thanks to all.